The qualities of a good scientist may vary to some extent with different specialties. But, every scientist needs to have a good foundation in science classes throughout high school and college, along with a good understanding of math. These basic classes give you a good start toward science careers. Two of the most common characteristics of scientists are curiosity and patience. Scientists are curious about the world around them, and they yearn to learn what makes everything work. Their inquisitiveness keeps them going ahead to the next project and the next experiment. They also must have patience to undergo the years of work that might be required to make a discovery in a scientific field. A sense of optimism keeps a scientist performing experiment after experiment, even if most of them fail. Scientists know that failed experiments provide answers as often as successful ones do. Scientists require patience to repeat experiments multiple times to verify results. Scientists need to be detail oriented, noticing even tiny observations and remembering and recording them. Their minds tend to be analytical, and they can categorize data in an efficient way so it can be recalled later. They usually have facts and hypotheses from several fields and experiments tucked into their memories so that they can be put together in different combinations to answer questions or provide direction for research. Being open-minded is crucial for successful people in science careers. A good scientist will accept whatever outcome his or her work has and not try to force the results into a preformed opinion. A scientist also has good ethics and will not give false results or shade an experiment to fulfill the expected outcome. He or she will accept the solutions of others, even when they conflict with his or her own. Most people think of science as an uncreative field, but in reality, scientists must be very creative. They ask why something happens or what happens and then devise experiments to answer the question. Their creativity allows them to think outside the box and envision things that cannot be seen. They must be ready to give up old ideas when new ones come along. The best scientists are tenacious and determined. They realize that their life’s work may take decades to reach a conclusion and that they may be starting in the wrong way and need to change course. They also understand that, as they build on the work of scientists from past generations, their own work will likely be proven false by future scientists. 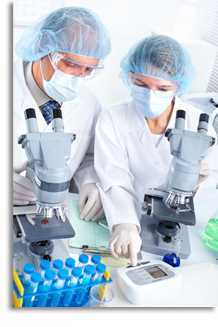 Scientists must be able to work as part of a team or to work independently, depending on the need of the project. They must be able to communicate effectively, both in writing and in speaking. People in science careers often work alone, but they also must have good networking skills. Joining and participating in scientific associations strengthen the ties in the scientific community, and scientists can help and support one another. A good scientist has the capability of explaining scientific ideas to a person who is not a scientist. People working in science careers in industry or government must be able to cooperate and to accept management from those in higher positions. They should be able to accept assignments of work rather than going off on their own. The best scientists also have some understanding of other scientific fields. Interdisciplinary teams and work are becoming more common as the boundaries between fields such as astronomy and physics or biology and chemistry become less clear. People in science careers must have an outstanding understanding of math, including calculus and statistics. Math skills are often needed to present scientific findings, prove results, and show their importance. People in science careers often need a strong ability to concentrate even in the midst of noise, but they must also have the capability of dreaming about possible directions to try or experiments to perform. Good planning and time management skills are critical. A scientist must be able to plan a course of experiments and then manage the time to perform them. They also must have excellent recording skills, as the details and results of each experiment must be documented.